Through the magic of Facebook I was able to catch up with Chief Jules Strongbow. I did a search and came up with his daughter Melynda. She gave me his number so I gave him a call. He sounded very happy in life. It is sad but so many of the wrestlers you talk to have had troubles once they left the business. So it’s great to speak to someone who has embraced his new life. I met Jules through Afa the Wild Samoan and had the chance to referee his matches many, many times. His matches were very good and very solid. As a referee if you were ever getting tired just get assigned to a match with Jules Strongbow facing Charley Fulton. You could leave the ring rested and revived again. The only problem would be keeping a straight face Jules always like to see if he could make me laugh during a match. If you know me well there then you may not believe this but there was a time I had the same problem with Jerry Lawler. It was practically impossible to keep a straight face with his constant bantering. I remember watching wrestling from California and seeing Frank Hill wrestle on many occasions. I didn’t know anything about him but that he was a “good” guy and in those days. I loved the good guys. I can remember watching wrestling on WWOR TV CH9 out of NY Chief Jay Strongbow was having a match with someone. I truly don’t remember the details but that match brought out the appearance of his brother Jules. His brother Jules was Frank Hill from California but through the magic of television and in Allentown, PA. Jules Strongbow was born. The Strongbow Bros would become a team and defeat Fuji and Saito for the titles. I don’t believe that Jules ever got the recognition that he deserved. I truly believe most of that came from jealousy. 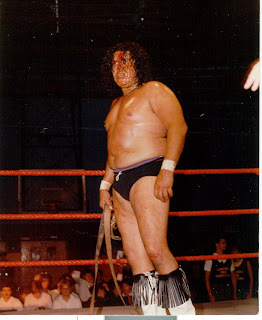 Over the years Chief Jay Strongbow was a regular in the territory for the most part. His old partner Billy White Wolff (Sheik Adnan AlKaisse) had long ago left the territory. I can tell you that Jay was in very tight with the McMahons and was basically going to be there as long as he wanted to be. He not only wrestled but was an agent as well. The agent position was the equivalent of the current producer position. The one difference was that the agents gave input into matches not lay them out step by step as they do today. The wrestlers didn’t need that type of assistance in those days. When Jules was brought into the territory it was to give one of the companies more favored employees a reason to be more in the spotlight. In fairness Jay was very popular with the fans. He was not main event star in "A" clubs. The Chief was a very unique individual in many ways. If he liked you, you had it made and if he didn’t you had an uphill battle in front of you. Over the years he had been featured and pushed he was a sometime tag team partner of Bruno Sammartino. He had feuds over the years one with Greg Valentine that I remember culminated in an Indian Strap Match at Madison Square Garden. He was a trusted employee that the company was going to push and went out of the way to do it. I am sure that when Jules was given his notice it was a political move. In Jay’s mind there was only going to be one Indian in the WWF. My first trip overseas was to Doha in Qatar. The trip was run by Afa “The Wild Samoan” and Jules was also on it. I was very surprised to hear from Jules that one of his daughters was now living in Doha. It was a nice experience being there plus it was also my first plane flight. I have no idea how many of Jules matches that I worked but it was a lot and I can honestly say that he NEVER had a bad match that I was in. We traveled to other places like Bermuda and Egypt and Sydney, Australia which was a huge highlight for many of us. I was booking a show in nineteen ninety two in Vermont. I was using Jules that night in the main event. I also used him to assist me in winning what was one of my very first matches. I was very limited at the time but I was working with a guy named Scott Taylor who came highly recommended by a referee friend of mine Billy Silverman. We used him on shows many times and he eventually made it to WCW and WWF. He sure recommended the right guy for me to work with. I was a heel in those days so I had Jules hit the wrong as the referee was distracted and put the sleeper hold on him. How about a heel Indian for a change? It was Jules idea to turn heel so we eventually let him do it. On this night we were coming back in an eight man tag team match at the end of the night so we needed some heat. The place was standing room only. It was funny when we got there we found out the last time that this place had wrestling Jay Strongbow was in the main event. In those types of building Strongbow could carry the load the “B” clubs. So with Jules and Demolition Ax as our top guys, we did real well that night. The interesting thing about my opponent that night is that I knew he had it. He eventually went on to become a WWE star you may know him as Scotty Too Hotty. It has been about seventeen years since that match and ironically I will be teaming up with Jimmy “Superfly” Snuka and Scotty Too Hotty in Leesburg, Fl on June 13th at the Armory. It all comes full circle the longer that we are here. I have barely touched on my experiences with Jules Strongbow. I could have written much more and smiled through a great deal of it. It really boils down to this great worker, good person, just wanted to feed his family, got out of the business healthy and moved on to the second phase of his life. We had a lot of good times together. I hope I can convince him to get out and do some conventions we will have to see what the future holds. It is great when in a business that has lately had some negative attention brought to it via premature deaths and personal financial crisis can share stories of happiness. It is true that due to poor financial decisions or personal demons that the wrestling business has had some fallen stars. I don’t know that our industry has any higher percentage than any other given industry but sadly perception is reality. The good news is that there is also another side of the fence. There are the Wendi Richter’s and the Stan Lane’s who walked away on their own terms when they wanted to. The business decisions made by promoters many times can force a performer to compromise their principles. In the case of Richter and Lane they didn’t have the burden of poor life choices to play the deciding factor about their careers. They still make occasional appearances when the circumstances are right. When you speak to both of them they are physically sound and mentally in great places in their lives. It’s legends like Strongbow, Richter and Lane that can show our whole industry that success is possible and a happy future is within reach. Some bad news that I got tonight was that Princess Jasmine the lady wrestler passed away. She had come to Egypt on another tour run by Afa. Of course Jules was on that trip too it was a good tour. I can say that Jasmine who was from the Chicago area and I didn’t get along that well. I wasn’t close to her but she was also a great talent who never got the breaks she should have gotten. I worked with her on some Indy’s and in Egypt. It’s sad that she went so soon. She was a worker like Leilani Kai and Judy Martin were workers. It’s just another sad loss for our business. This photo was taken somewhere in Massachusets after a match Jules had with Pretty Boy Doug Sommers. The was run by Afa the Wild Samoan I was the booker at the time and head referee. What a pleasure it was and so easy to work with two masters of the wrestling ring. If you think Jules looks bad Doug was bleeding just as bad it was a real war that night.